The Lutheran reformers understood that there was great benefit in remembering the saints whom God has given to His Church. The Apology of the Augsburg Confession (Article 21) gives three reasons for such honor. First, we thank God for giving faithful servants to His Church. Second, through such remembrance our faith is strengthened as we see the mercy that God extended to His saints of old. Third, these saints are examples by which we may imitate both their faith and their holy living according to our calling in life. The calendar of commemorations lists a number of men and women from both the Old and New Testaments and from the first 19 centuries of the Church's life. Their defense of the fundamental beliefs of the Christian faith and/or their virtuous living have caused these individuals to stand out over time as persons worthy of recognition. In every case, the purpose of our remembrance is not that we honor these saints for their own sake, but as examples of those in whom the saving work of Jesus Christ has been made manifest to the glory of His holy name and to the praise of His grace and mercy. 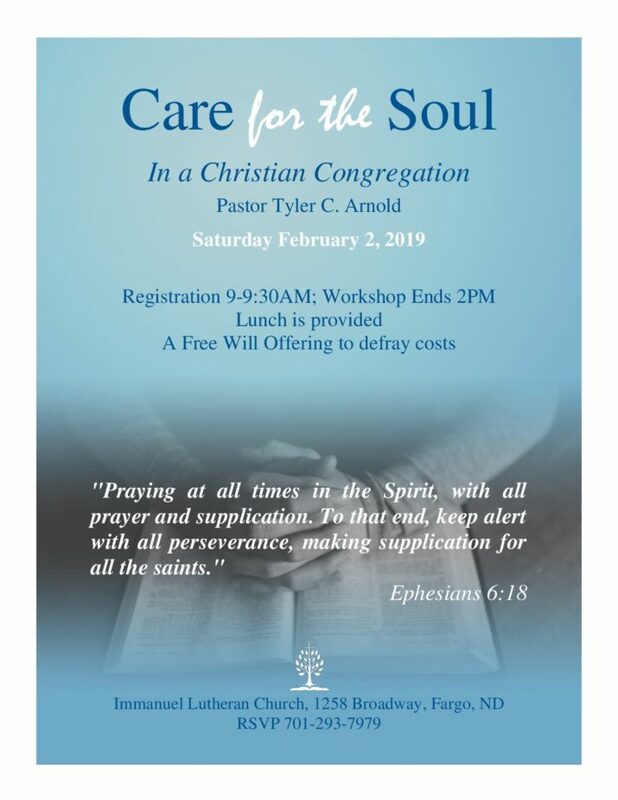 On Saturday, Feb 2, 2019, Immanuel Fargo will be hosting a lay workshop that will focus on elders in the church. It will not be for elders alone, but we are going to talk about care ministry with a congregation and that will impact elders a great deal. Pastor Arnold comes to us from Doxology and he works with them in much of their care ministry. We think this will be an excellent and most helpful topic! The elders at Immanuel, Fargo will be providing a lunch that day. We start at 9 AM with registration. Free will offering will be taken to defray costs. Pastor Arnold will also be our guest Sunday, Feb 3rd at Immanuel, Fargo. 2601 – 23rd Ave. S.